Railpictures.ca - Marcus W Stevens Photo: Its no secret that General Electric’s Dash-8 locomotives days may be numbered. Many Class 1 railroads have already drastically thinned out their fleets as newer environmentally friendly units come on line. The Dash-8 line though was a turning point for GE, and innovations created with the model gradually helped push the builder into top spot. 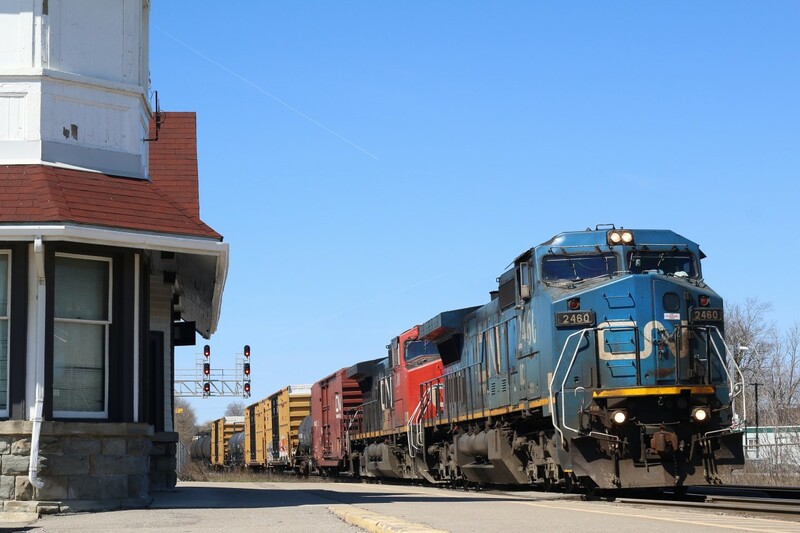 Better fuel consumption then EMD’s SD40′s and SD60′s would help lead to the models longevity, while many similar six axle EMD products on many railways rosters were retired. Today CN rosters more of the Dash-8 variations then any other railroad in North America, and with new locomotives on the way by years end now is the time to capture as many Dash-8s as possible. Here CN “Blue devil” Dash-8 #2460 rolls under clear blue skies at Georgetown as it runs off its last leg of its trip to Toronto yard. | Railpictures.ca – Canadian Railway Photography – photographie ferroviaire Canadienne. Caption: Its no secret that General Electric's Dash-8 locomotives days may be numbered. Many Class 1 railroads have already drastically thinned out their fleets as newer environmentally friendly units come on line. The Dash-8 line though was a turning point for GE, and innovations created with the model gradually helped push the builder into top spot. Better fuel consumption then EMD's SD40's and SD60's would help lead to the models longevity, while many similar six axle EMD products on many railways rosters were retired. Today CN rosters more of the Dash-8 variations then any other railroad in North America, and with new locomotives on the way by years end now is the time to capture as many Dash-8s as possible. Here CN "Blue devil" Dash-8 #2460 rolls under clear blue skies at Georgetown as it runs off its last leg of its trip to Toronto yard. Least the snow is finally gone that was on the platform when I was there last Sunday lol. Nice catch ! Agreed Stephen, but I am looking at the big picture. If you look at the history of rebuilds by builder. EMD products far outnumber GE. Look how many SD, GP, SW’s have been rebuilt. How many U series, B or C series GE’s do you see? EMD SW1′s GMD1′s are still out there. The same can’t be said for GE. Its only now that the railroads are looking at Dash 9′s are rebuild material. GE may have overtaken EMD products a long time ago, but EMD units have been rebuilt over and over and are still the main staple for rebuilds. Even with the conversions of older GE to AC or upgrades. GE units will never be as good fodder for rebuilt products. Thats a nice catch, Marcus!!! Someone punched the 2460 on the right eyebrow.